On long weekends local and foreign tourists troop to the fun-filled and exciting Alligator Lake, some 60 kilometers southeast of Metro Manila to take a dip in the famed hot springs and for water adventure sports to escape the scorching heat of the metropolis. From the vantage point at the Laresio Lakeside Resort and Spa in the nature city’s Barangay Tadlac, one can take a breath-taking view of the natural freshwater crater lake situated along the southern shore of Laguna de Bay. Alligator Lake is so called not because of the presence of the freshwater reptilian creatures but because it is an alligator-shaped body of water. Local folks also said the two prominent terrain hilly landforms appear like the extinct dinosaurs trekking by the lakeshore. But a lot of tourists and visitors beat the heat at the onset of the El Niño phenomenon by water sports offered in this 22.7-hectare (56 acres) slightly elevated lake which is separated by a rock hill and verdant vegetation and rainforest from the Laguna Lake coastline. In an interview Engr. Joseph Carmelo Lunod, Laresio Resort owner, he said scores of visitors and tourists flock to the place to take a dip at the Alligator Lake especially on long weekends. Lunod said many adventurers take the high jump and 12-foot high cliff-diving at the rock cliff’s diving board or opt to do kayaking, “balsa” (bamboo) rafting or swimming within the perimeter raft protected swimming area with refreshing waters that measure about 27 meters deep. According to Reggie Abanilla, resorts safety officer II, the diving site has a safety net and peripheral bamboo enclosures in the dive site including must-wear life vests for swimmers, divers and adventurers. Abanilla also said there are lifeguards stationed along the lake’s resort coastline for the safety and security of the bathers and swimmers especially in the 50-meter high slide and dip. 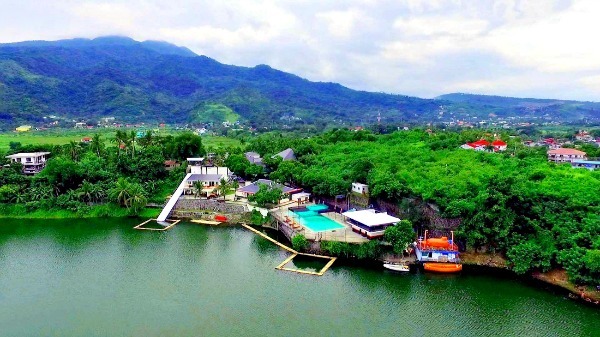 Local and foreign companies such as Rustan’s and Schneider Electric officials and workers also conducted their teambuilding activities but the alluring Alligator Lake is “simply irresistible” and some workers commented they could not leave the place without drenching in the Alligator Lake. Rory Mekan, a tourist from England, was awed at the natural crater-lake saying it is a respite from the humid climate in the metropolis and the traffic. He remarked enjoying the lake more than the resort’s hot spring villas and the natural hot spring pools as the lake also offers sports fishing. Thrill-seekers and adventurers also took time out for the 128 meter-long zipline, wall climbing, rappelling and the hillside viewing deck for the spectacular view of the mystical Mt. Makiling on its southern side and the lake view on the northern side. Alligator Lake is nestled in one of the marshlands of the Laguna Volcanic Field although declared inactive by the Philippine Institute of Volcanology and Seismology (PHIVOLCS).